Dan Meagher might come from a proud racing family, but he has hit the ground running in his own right in Singapore. 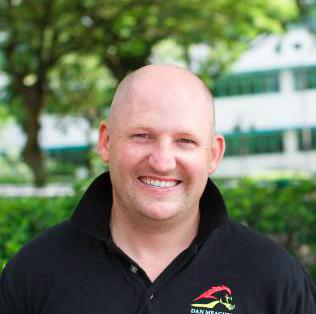 Dan has been training at Kranji racecourse since 2016 and has grown his stable from 3 to 65 horses over this period. He has had great success with horses such as Secret Win, Webster and Natural Impulse. Dan has the motto that if you have Happy Horses and Happy staff it will equal happy results. Dan has put together a great team on the track but he credits much of his success to his team off the track with some great racing minds in the camp such as Aussie ex-pat Danny Beasley helping Dan achieve outstanding results. Prior to joining his brother Chris and father John in Singapore, Dan worked for David Hall and the late Peter Hayes where he rode track work and picked up some training tips from these great horsemen. The Meagher family trained together in Singapore for 13 years. It was this time spent with his father that proved invaluable to Dan’s success as a trainer. John taught Dan to be hands on with horses and to be patient with them to maximise their potential. In 2016 Dan left the partnership and was fortunate to secure a license of his own to train in Singapore. Dan is a big believer in giving his horses time to mature and to take the time that each one needs as they all learn and come on at different stages. One example of this was Webster who came to him as a tiny, light undeveloped horse but was given time to mature and the patience has been rewarded with him stringing a number of wins together. Dan loves the Singapore lifestyle where they race twice a week on a Friday night and Sunday afternoon and trackwork for the Meagher stable begins each day at 4am. Dan also loves winning, however it is the process to get to that point is what gets him out of bed each day. He loves watching horses develop and coming along in their preparations and is excited when a new horse enters the stable and he has the job of working it out to ensure its maximum potential is reached. The facilities at Kranji racecourse are absolutely first class.There are 8 tracks that trainers can use including uphill tracks, sand, reverse, polytrack, 2 straight tracks and 2 trotting rings. There are also 2 swimming pools and 2 walking machines which have shade to help protect the horses from the hot & humid Singapore climate. Dan said the vets and service that they provide, is the best he has come across anywhere in the world. Dan also credits his success in Singapore to his wife Sabrina, son Caiden and daughter Harper who are a massive part of the team and a huge motivating factor for Dan. In recent times he managed a training double on the prestigious Singapore Derby card and his first Group win with Secret Win in the 2017 El Dorado Classic - a huge honour and thrill!